TDKK produces LED microscope bulbs to replace the halogen microscope bulb as presented in the article Microscope Light Bulb - the New LED. This one on one exchange will work for a lot of microscope models, but some microscope models have an “unwilling" microscope supply. Most normal microscopes with a halogen bulb have an adjustable power supply that is built to power the 20, 30 or even a 100 watt light source. Between the output of this supply, and the needs of the LED, are a lot of technical differences. The tension needed for a LED microscope bulb, is maximal 3,5 Volt, a halogen lamp uses 6 or 12 Volts for maximum light intensity. The LED lamp only takes about 3 watt while the halogen bulb needs up to 100 watt. The LED needs to be current controlled, while the halogen bulb needs a tension regulation in order to dim. With some electronic tricks, nearly all of these demands can be solved inside the LED lamp except in the case of an unwilling supply. An unwilling supply says: “I do not feel the 100 watt provided, only a mere 3 watt, so the lamp is broken", and so switches in shut down or pulsing safety mode. Even with a perfect LED, this supply will not work. In this case TDKK has a detour: Disconnect the halogen supply and provide a low power external LED supply. 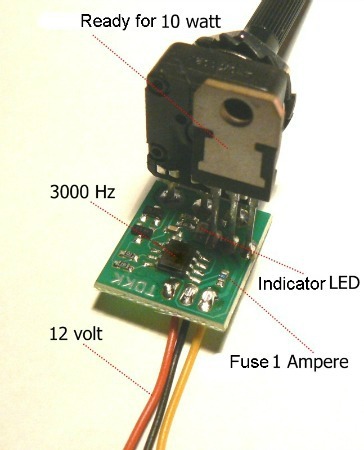 This new LED supply consists of a light weight transformer, a current limiter and a PWM dimmer, in one small regulator box. 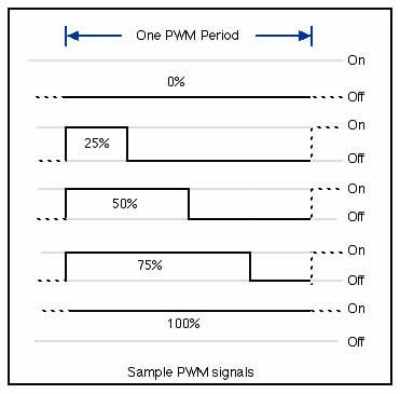 How does such a PWM Dimmer Work? You can imagine from the name, it has something to do with pulses, and the width thereof. Suppose I was able to repeatedly and equally switch a lamp on and off, so the on period was as long as the off period, the lamp would then burn for 50% of the time, or in other words on half power. If I would repeatedly switch the lamp short on, and for a longer time off, I may end up with a lamp burning at 20% of the time. Or opposite, and the lamp would burn at 80%. Every setting would be possible. Lucky for us there are electronic components available that can do this switching for us, and with great accuracy and speed. A human eye is able to recognize up to 35 light flashes per second, and even more when in motion. This means that the light pulses have to come with a higher frequency of (lets say) more than 100 times per second (Hz) in order to appear as a constant light stream. When discussing the differences of a LED microscope bulb replacing a halogen bulb, it's important to mention the high speed of a LED lamp compared with the slow response of a halogen bulb. When a halogen bulb is switched on it takes “some time" before the filament is heated, and also it takes “some time" for the filament to cool down when off. The reaction speed of a LED is very different, the LED switches on or off without any delay. Thus every action could be visible. Indeed, this is the case! When a LED is connected to a 100 pulses per second PWM, we can see moving objects, similar to a cartoon movie (stroboscope). The higher the speed of the movement or the finer the structure of the moving object, the higher frequencies can be seen. TDKK found out that the speed needed for a smooth and flicker free microscope image, would lie around 3000 Hz (times per second). Even at this speed, the electronics can adjust the on and off time of each pulse. So within 1 second, 3000 pulses have been set to (for instance) 30% on time, resulting in low intensity in our microscope image. Now we need only a button to change the percentage, and the dimmer is ready. If this speed was applied to a halogen bulb, it would start “singing" (actually making noise)!